Offering a personalized shopping experience to over two million unique website visitors per day isn’t easy, especially when you advertise approximately eleven million items. For Marktplaats, GoDataDriven has developed smart algorithms that use machine learning technology to ensure that buyers see the right ads in any channel. These “personal recommendations” have resulted in a 3.5% increase in user time spent on the platform. Because of these positive results, Marktplaats has assigned a critical role for data to support change and has made sure that all product teams include data scientists. Marktplaats had already been using data to optimize its platform for some time, but it wanted to improve its user experience even more, as well as the overall effectiveness of its ads. They asked GoDataDriven to help them create a data science competency within their organization. To develop its data applications, Marktplaats created a separate, multidisciplinary team consisting of a product manager, data scientist, developer, marketer, and tester. The team began collaborating with GoDataDriven, defining applications and developing initial proof of concepts. GoDataDriven chose to start with small experiments and proof of concepts and then develop them further as they proved successful. One of its first successful proof of concepts was showing personalized ads based on a search. For this use case, it was a major advantage that Marktplaats doesn't exclusively process search traffic, but also owns the ad platform. 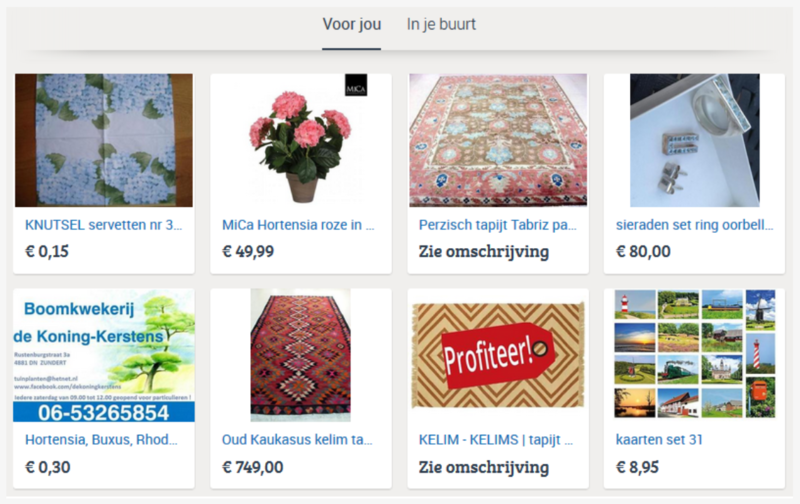 Since Marktplaats had direct access to the ad content, developing the recommenders autonomously was a lot easier to do. Three-quarters of all traffic on Marktplaats comes from mobile devices. It's important to make smart use of the limited screen space on mobile. Showing optimized content based on available user data has led to more relevant offers. Marktplaats' optimized homepage (created by GoDataDriven), which shows both paid and free ads, has led to a 3.5% increase in time spent on the platform. The number of (sometimes paid) clicks also went up. The Marktplaats web analytics showed that the platform had two types of users: those who used the search box on the screen (search) and those who navigated using the menu (browse). Marktplaats started combining the results for both types of users to show relevant ads, and the results for shown ads increased significantly. Identifying patterns and making the data as complete as possible was necessary to improve the recommendation system. For example, Marktplaats can see a clear difference between the search behavior of male and female users. By comparing usernames to databases of typical boys' and girls' names, it correctly estimated the gender of 47% of its users. "The analysis of search behavior provided some interesting insights. For example, people who sold a particular size of children's clothing often also purchased children's clothing that was two sizes larger. With growing children, this seems obvious, but it's good to see this trend reflected in the data. There also turns out to be a significant correlation between, for instance, coin collectors and metal detectors, “ Rutger Mooy explained. To help users make a selection from the over 180,000 cars advertised on the platform, Marktplaats introduced a collaborative filtering system that recognizes which cars strongly relate based on search behavior. Using this data, Marktplaats now emails relevant car ads to potential buyers. It has received excellent feedback on these emails from users. Marktplaats offers millions of users a unique experience by recognizing and providing relevant product recommendations. The entire organization has embraced the data-driven approach, and it is actively expanding its product teams with more data scientists. Other eBay labels have created and introduced smart data applications combined with technological developments based on Marktplaats's positive experiences. "For example, image recognition, will make it even easier for sellers to place ads," said Mooy. For Marktplaats in particular, GoDataDriven used technologies such as Hadoop, Spark, Kafka, R, Python, Java, and Scala. Of course, data and (open source) technology play a major role, but organization, skills, and process are equally important. How do you take control of your business? Feel free to get in touch and let us now! • Article - GDPR: "May 25th is when it really begins"